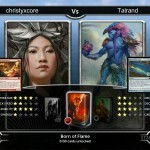 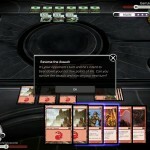 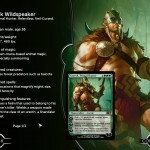 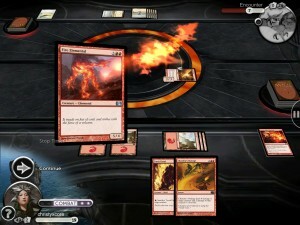 Magic 2013 (Free) by Wizards of the Coast finally brings the strategic trading card game to the iPad. 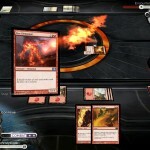 It was inevitable, and definitely a welcome sight to see for iPad-owning Magic players. 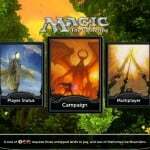 I’ve been playing Magic for several years, though I did take a hiatus from the game for a while. 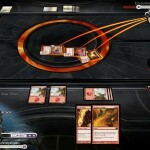 Recently, though, I’ve come back to the game (during the Innistrad block) and have been enjoying building my own custom deck and playing against my boyfriend and the local competition at the comic book store. 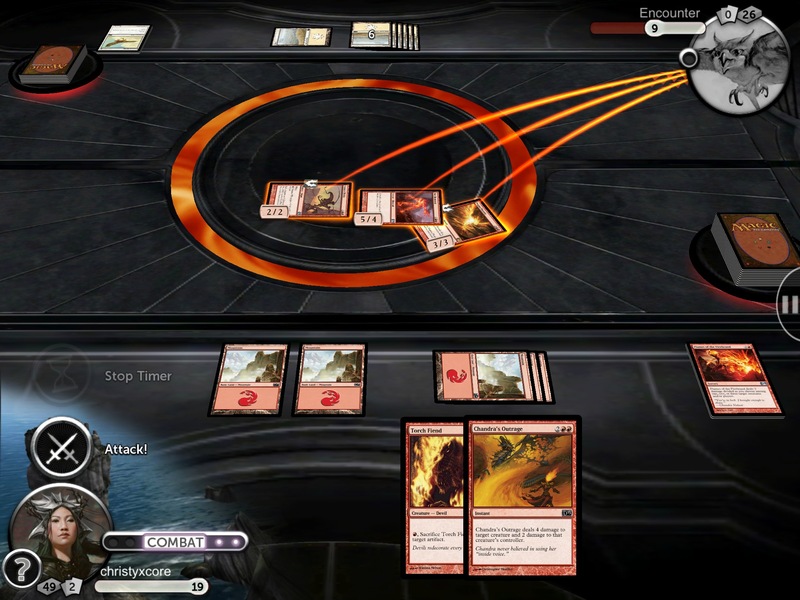 The only problem with having to play with physical cards is the fact that everything is done manually, and you need the tokens, counters, and other extras with you when you want to play. 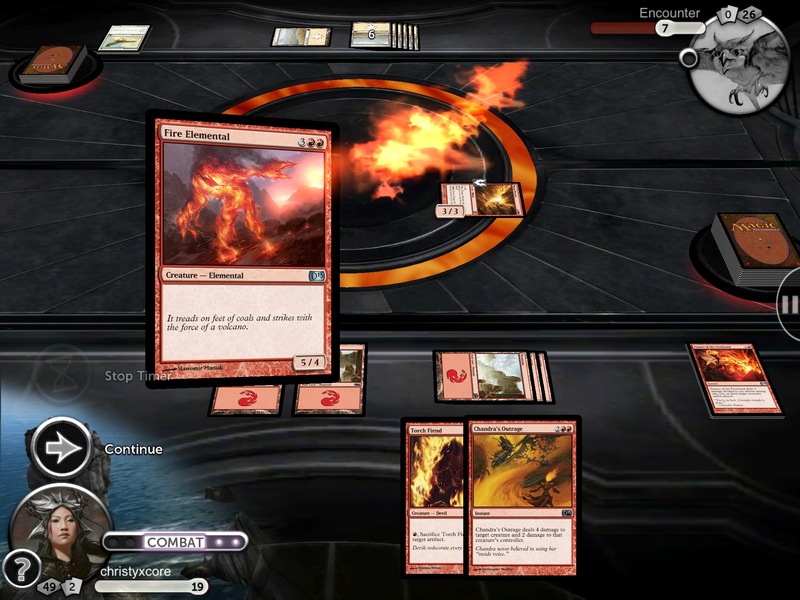 With Magic now available on your iPad, playing the game has never been easier. 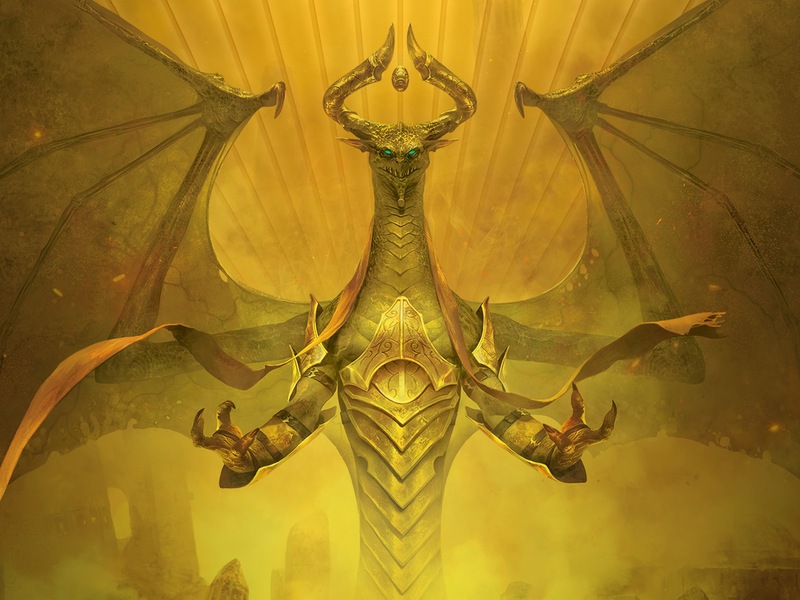 The initial download will provide you with three decks to start with, each having five cards to unlock: Born in Flame, Pack Instinct, and Crosswinds. 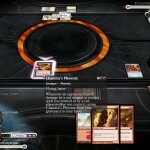 The single-player campaign mode takes place across the plane of Shandalar, with four opponents. 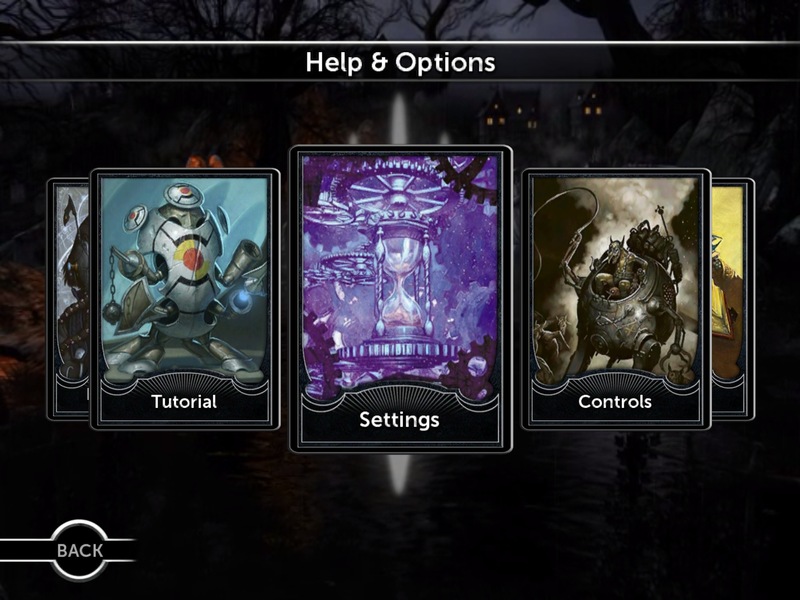 The main menu of the game has several sections for you to scroll through: Help & Options, Leaderboards, Deck Manager, Player Status, Campaign, Multiplayer, Custom Game, Store, and Extras. 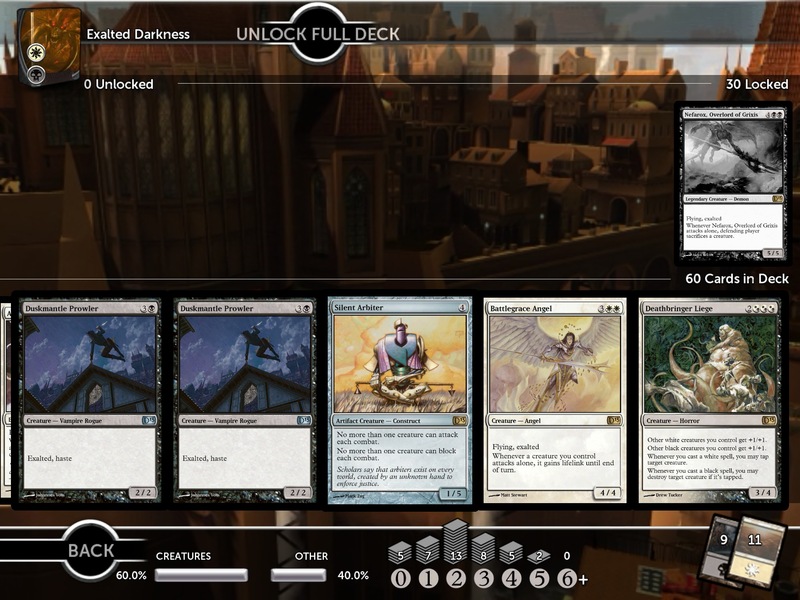 I found that playing Magic this way is actually pretty nice. 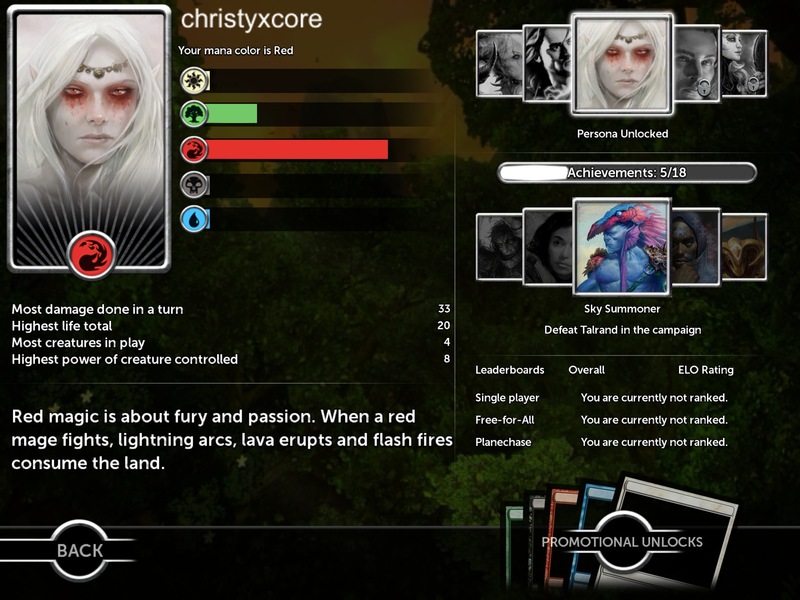 The game will clearly display each phase during the turn: Beginning, First Main, Combat, Second Main, and Ending. 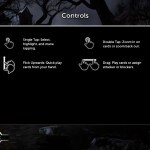 Your hand is visible to you at all times and a simple tap of a card will bring it up to the “front,” where you can read the text on a card. 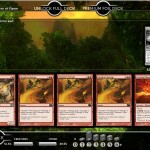 Dragging a card out to the playing field will put it into play, assuming that you have the mana to pay. 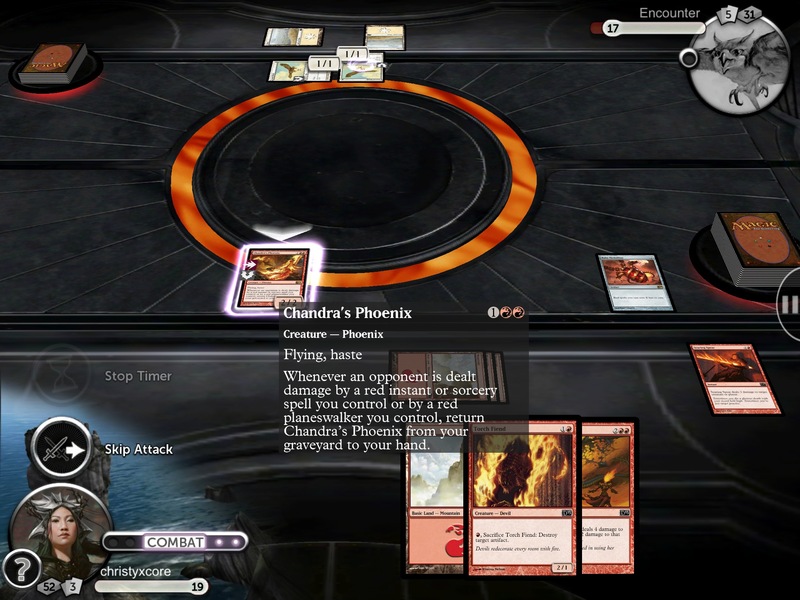 The game will automatically detect if you have anything to play during your Main Phase, so if you don’t, you’ll see the progress bar move through your phases and on to the opponent’s turn. 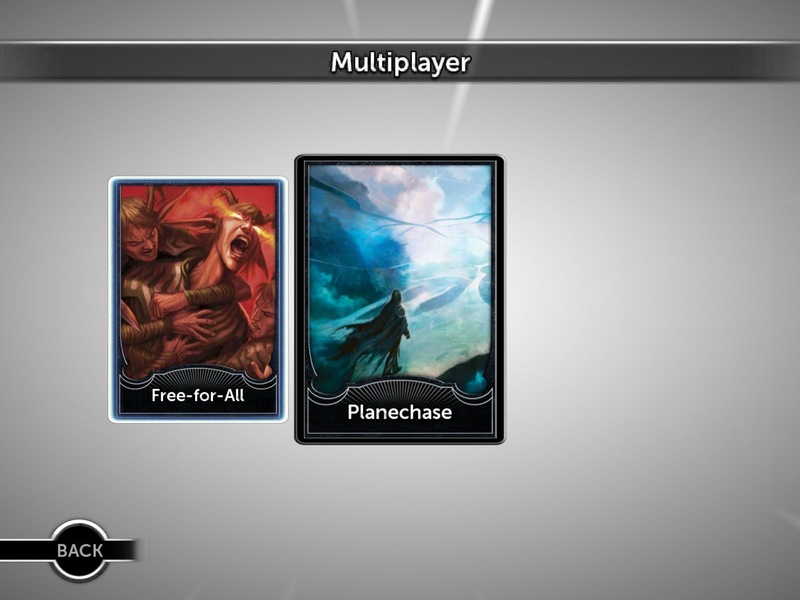 For any card that has an ability, you can double-tap on them to view it and activate it, if able. 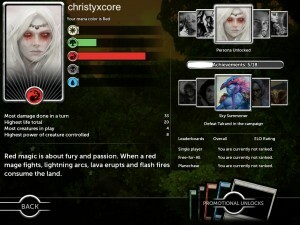 Doing a double-tap on any card (including in the graveyard) will also allow you to zoom in and view the card text. 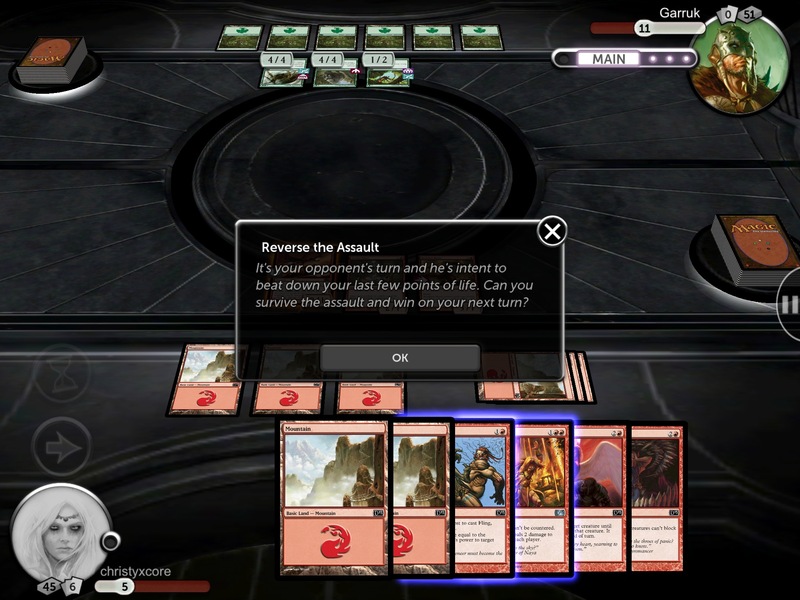 During the Combat Phase, just tap on the creatures that you want to attack, pick a target, and confirm with the “Attack” button. 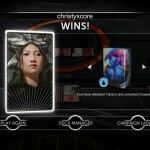 Once a duel is completed, you will unlock additional cards for your deck and earn achievements and profile avatars. 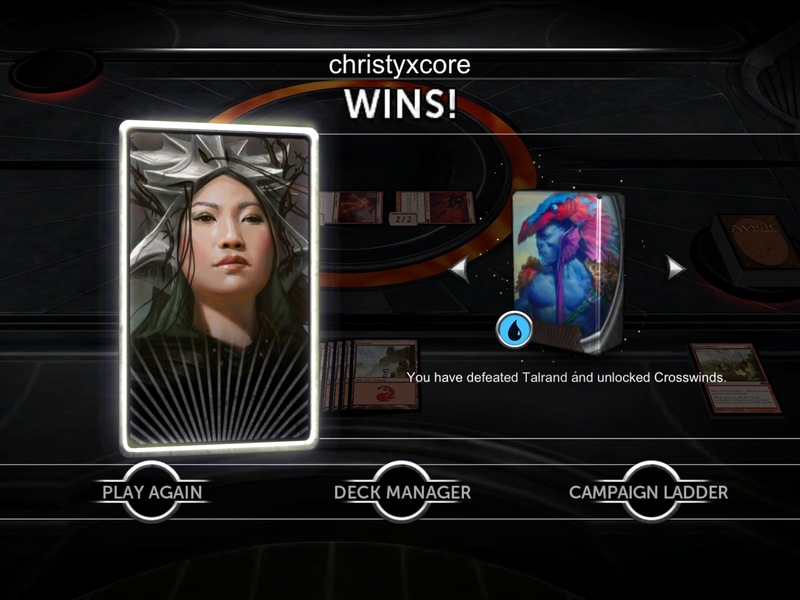 You can then Play Again (a rematch), go to the Deck Manager, or Campaign Ladder. 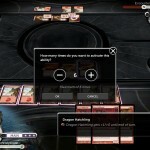 The only negative though, is that if you unlock a card, it will automatically be put into your deck — for those that strictly play 60 card decks for the best strategy, this can be a bit tedious, as you will have to keep going to the Deck Manager to adjust your deck after each battle. 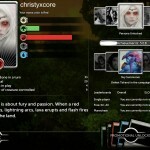 If you’re ever curious about how you’re doing, you can check out the Player Status. 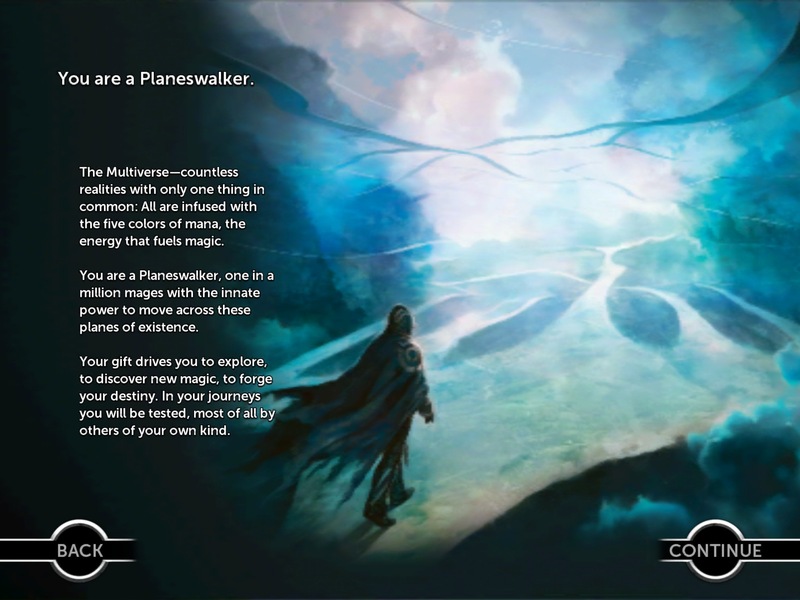 You’ll find neat tidbits such as your mana color (preferred playing color), personas, achievements, most damage in a single turn, highest life total, most creatures in play, and highest power of creature controlled. 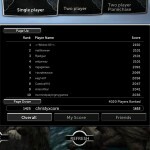 Leaderboard ranking information can be found here as well. 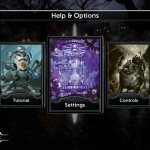 Options for various game settings can be changed in Help & Options. 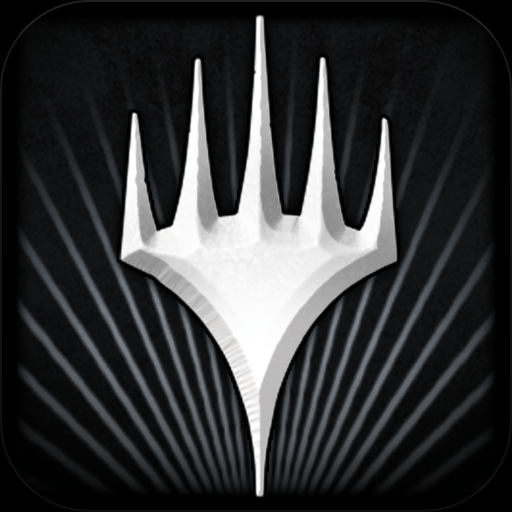 While the game is free and a great start for beginners to get into the world of Magic: The Gathering, it’s also very limited for advanced players. 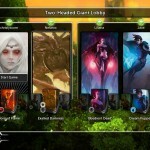 If you want more content, there are in-app purchases. 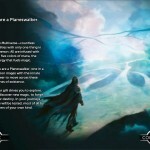 For $9.99, you get the full game, which means 18 campaign levels that are played out in the planes of Ravnica, Alara, and Innistrad. 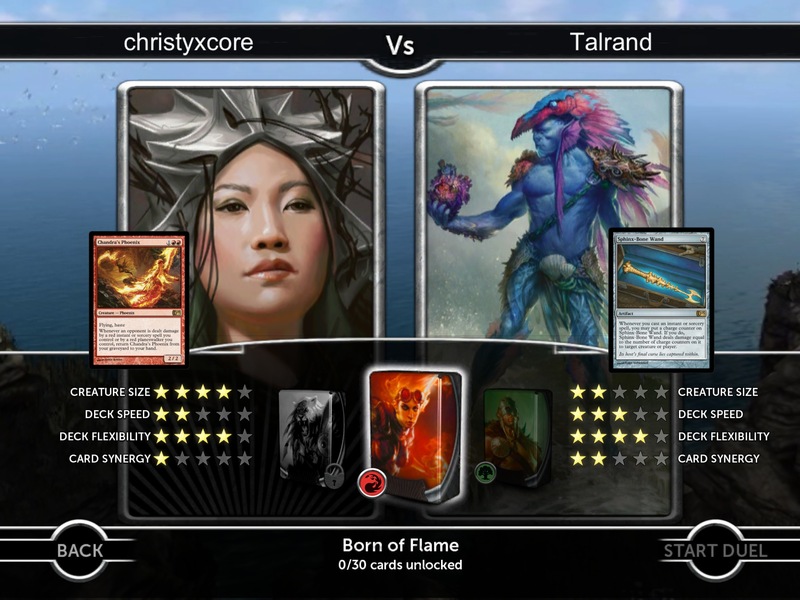 The full game unlock will also get you 11 Revenge matches and 10 challenges, as well as three Planechase battles, with over 250 cards to unlock as you play. 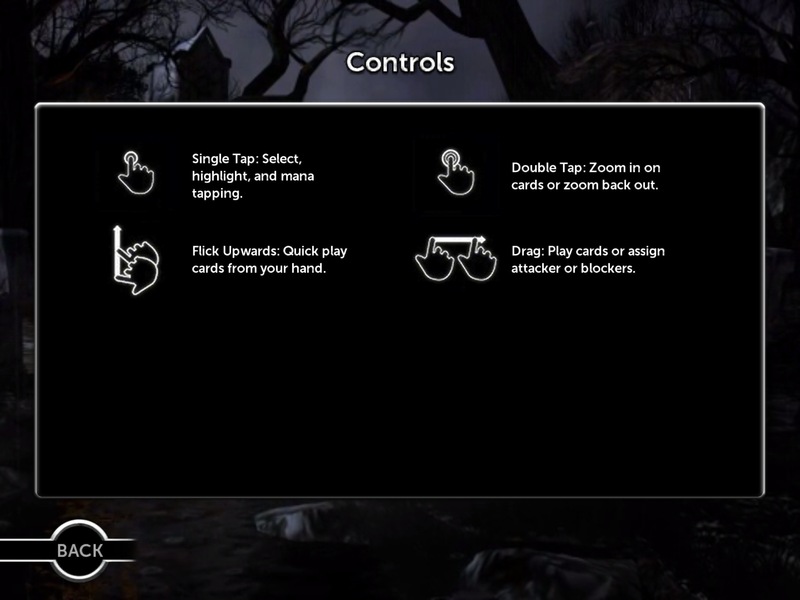 Multiplayer mode will be available as well, with online play through Game Center. 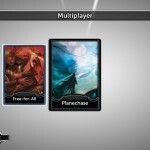 A special bonus for the full game: players will get a code to enter online to redeem a free six-card booster pack with a promo card at participating retailers. 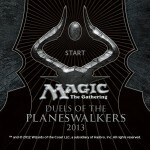 This promo is also available for the Xbox 360 and PS3 versions of Duels of the Planeswalkers 2013. 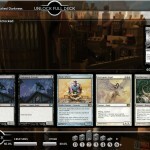 If the starting decks are not enough to satisfy you, there are seven additional decks to purchase at $0.99 a pop: Dream Puppets, Goblin Gangland, Obedient Dead, Peacekeepers, Exalted Darkness, Ancient Wilds, and Celestial Light. 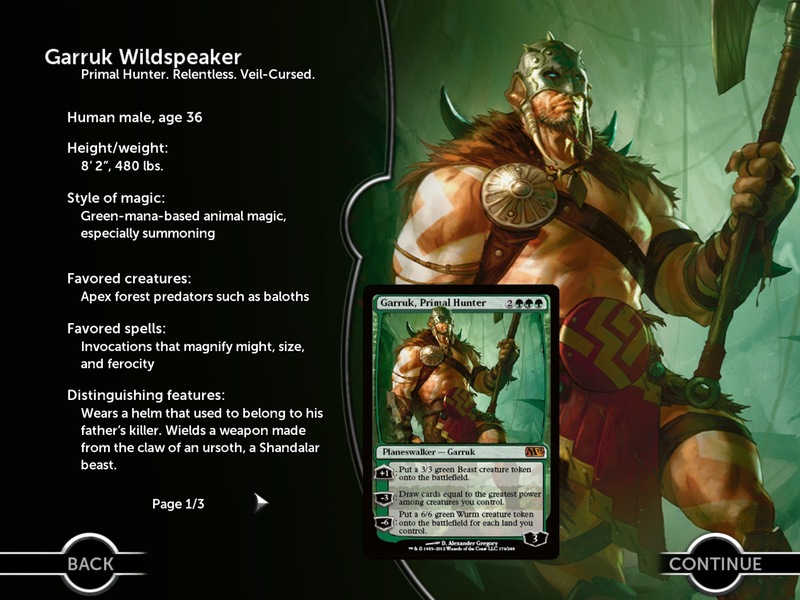 A “foil conversion” purchase is available as well for another $0.99, though I find this rather pointless for digital cards — real, physical cards are a different story though. 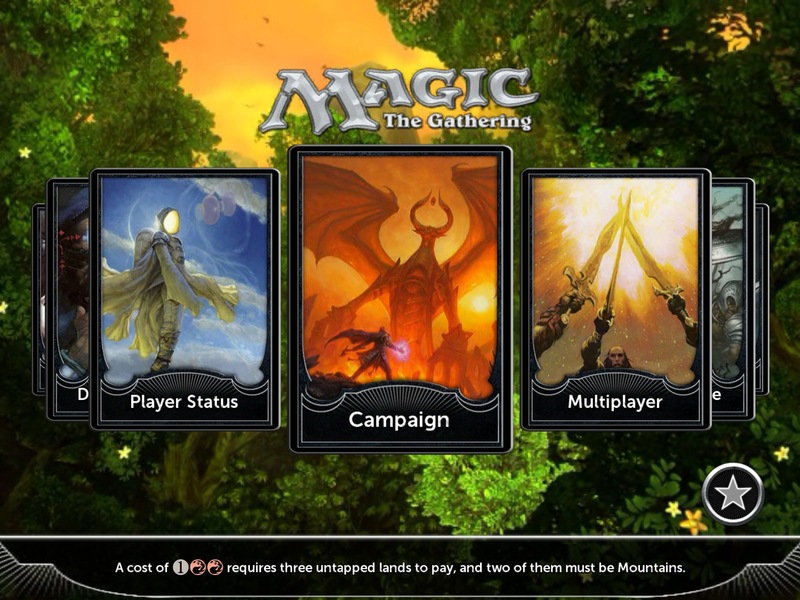 I decided to get the full game, and so far have been pleasantly surprised with the amount of content. 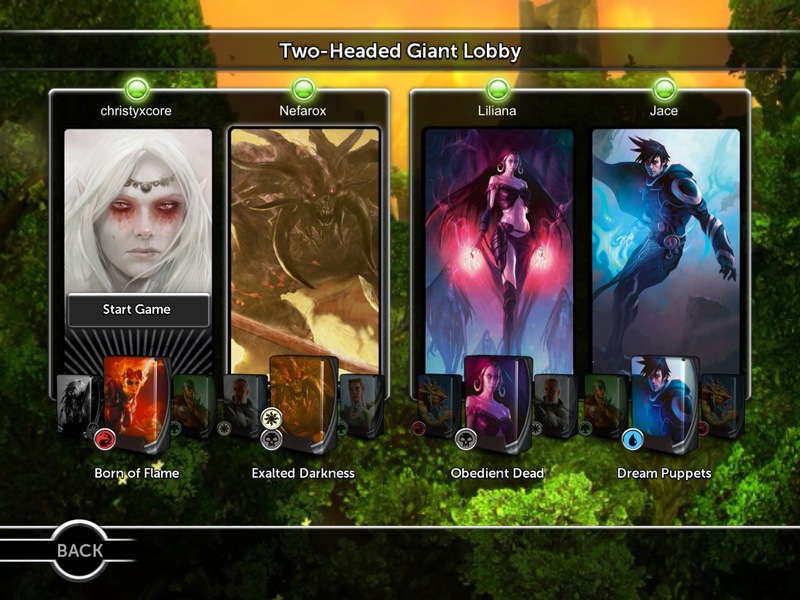 Having challenges and other game modes to play is a nice change from the standard fare that I normally play, and I’m especially enjoying the Two-Headed Giant mode (a team battle) from the Custom Games option. 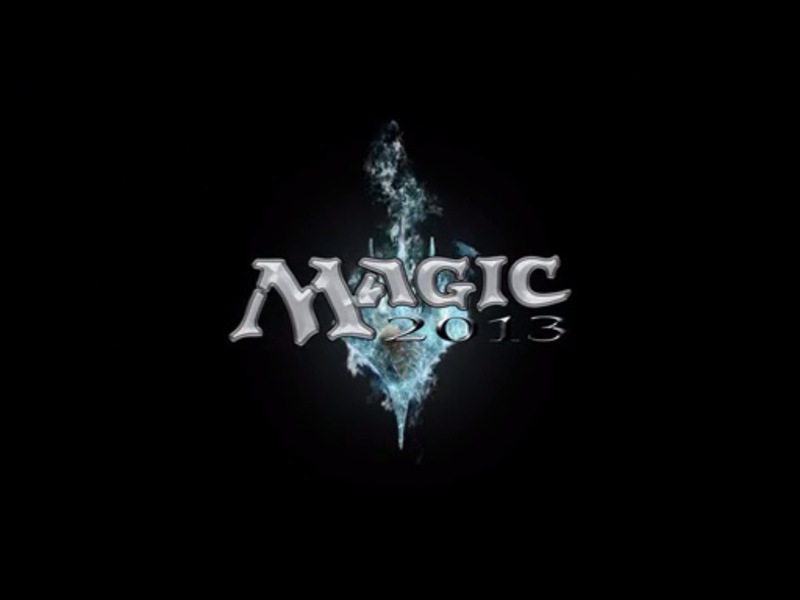 Since the game is free to try out, there is absolutely no harm in downloading it and giving it a spin, especially if you’ve never played before. 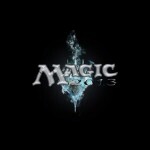 I find it’s a great way for beginners to learn and see if they like the game mechanics, since you don’t have to know someone that plays the game already and get a starter deck for an average MSRP of about $12. 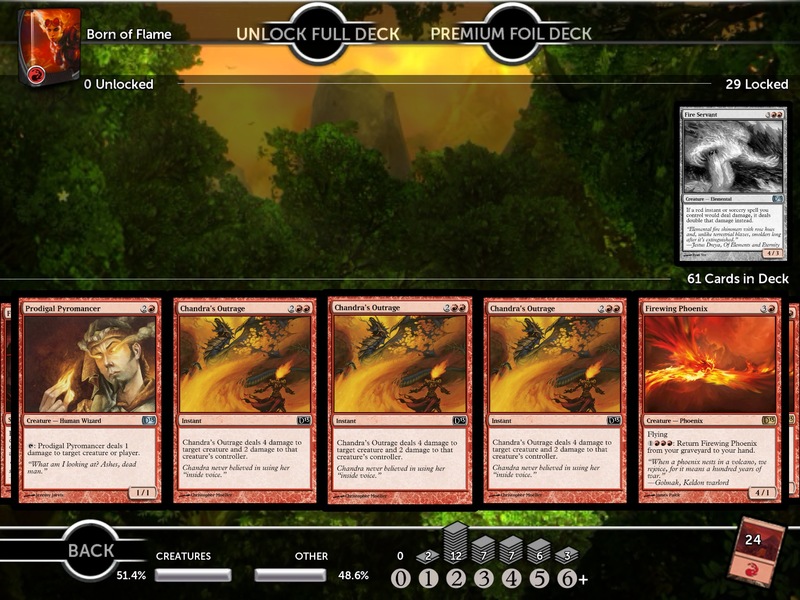 For advanced players, I would recommend unlocking the full game. 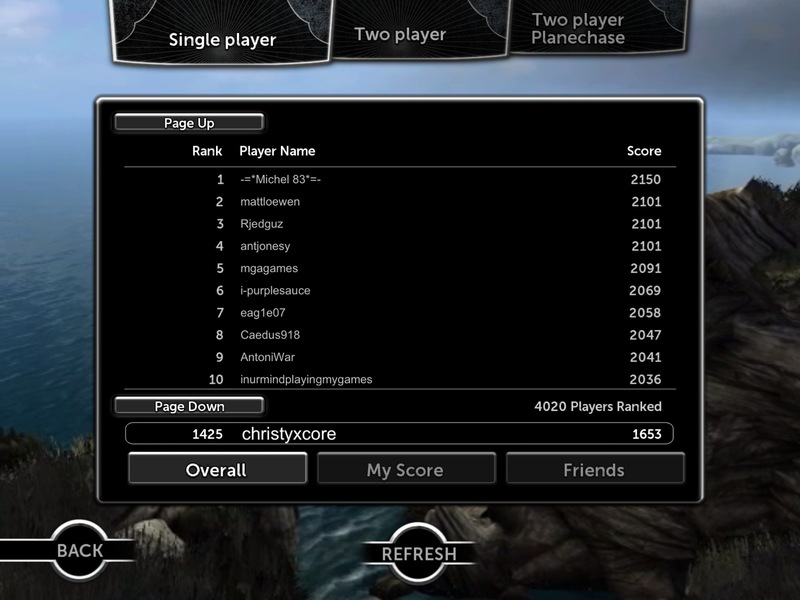 The game modes are challenging and satisfying, and will most likely leave you with a sense of accomplishment. 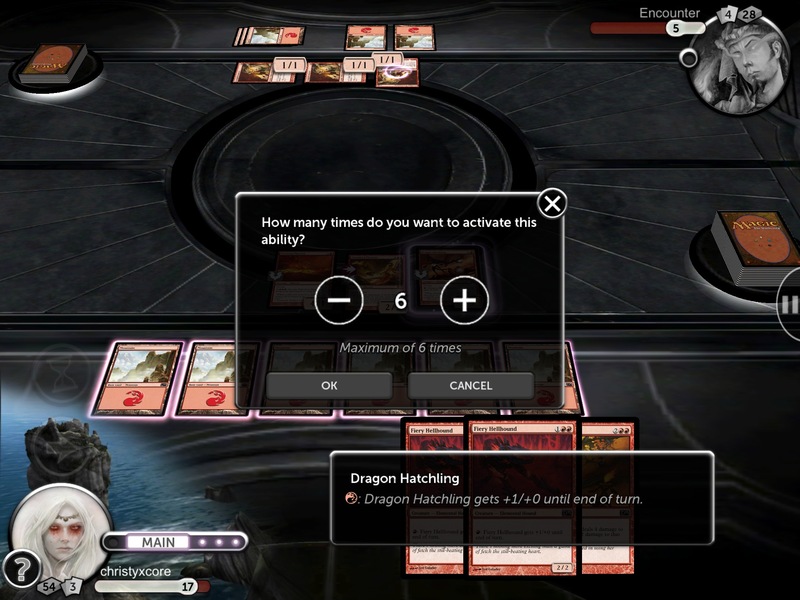 Picking up additional decks will depend on individuals; fortunately, you can browse through decks (and all the unlockable cards for it) to decide if it suits your play style. 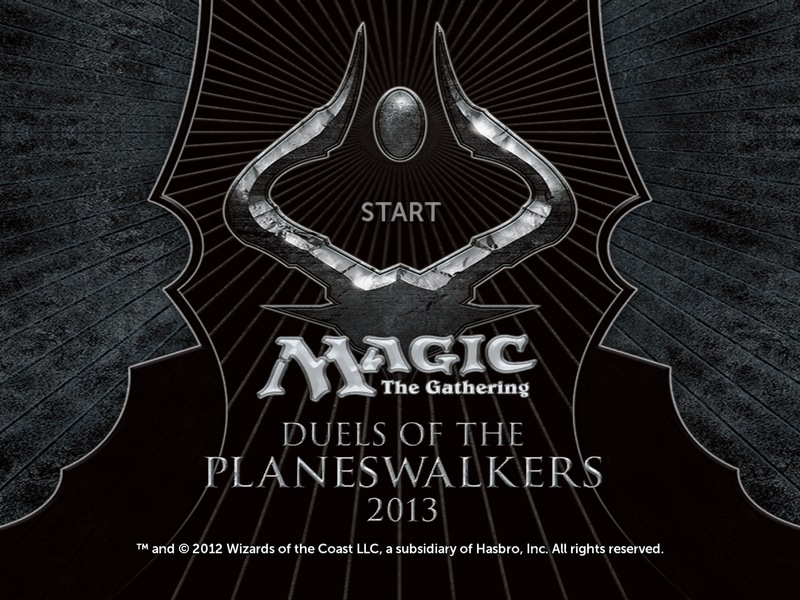 Either way, check out Magic: Duels of the Planeswalkers 2013 for free in the App Store. 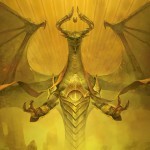 It's a great way to get a preview of the upcoming Core Set 2013 cards, which will be released to the public on July 13, 2012.